Crooked Pint Ale House is a nouveau urban pub with the feel of a local neighborhood restaurant. Crooked Pint offers a full menu and a generous selection of beer, quality craft brews, wines, and spirits. From the rough-sawn oak floors and classic pub furnishings and finishes, to the fresh recipes and authentic smiles, everything at Crooked Pint is the real deal. Families and friends as well as couples and groups will feel welcome and right at home at Crooked Pint. The menu features classic pub fare with nearly 60 choices for lunch, dinner, and weekend brunch as well as kids’ menu selections. Beer is root of all good at the Crooked Pint. We take great care in delivering the highest quality draft beer to you each day. Our beer system is engineered with state-of-the-art stainless steel components to provide the best possible taste and flavor. It also delivers the beer at the optimum temperature from the keg, right to your glass. We take pride that every pint, every time is properly poured and served. Raise a pint with us! 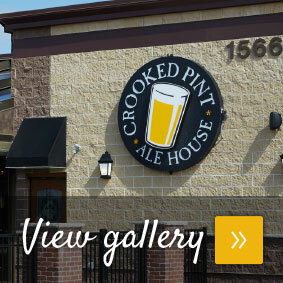 Now that we’ve wet your whistle, visit the website to learn more about Crooked Pint Ale House.